I saw this at my friend's house last year and LOVE it. She made it with a cheap cookie sheet and match boxes. 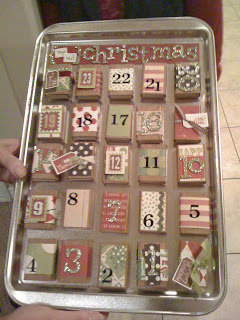 With decorative paper, fun number stickers, bows, tags and christmas letters, she created an adorable countdown chart. In each box, you could put something to do each day, a quote about Christmas or a little treat.